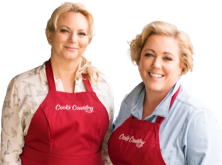 Julia Collin Davison unveils the secrets to the ultimate Barbecue Chicken Thighs to host, Bridget Lancaster. Then, tasting expert Jack Bishop challenges Bridget to a tasting of popcorn. And finally, test cook Bryan Roof demonstrates how to make Fried Peach Pies at home.